BHS Industrial Shelving (IS) is open style, industrial-grade steel shelving that provides heavy-duty surfaces for storing all types of products and materials. This highly functional storage solution features fixed-height shelves and is perfect for stockrooms, machine shops, and warehouse settings. These storage racks are fully powder-coated for better corrosion and scratch resistance, providing a more reliable storage and organization solution for any industry. Large foot pads give extra stability and protect flooring. This shelving can easily withstand the harsh conditions of warehouses and other industrial settings. We offer a wide variety of models to meet any storage needs. A 36-inch height between shelves is standard, but BHS can custom-build industrial shelving systems to meet individual specifications for a more efficient storage room layout. 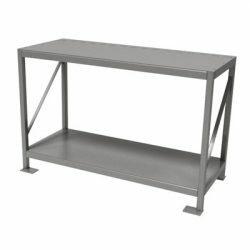 Protect your product with reliable and durable Industrial Shelving from BHS. Contact our sales team at +1 314 423 2075 to learn more about our Warehouse Equipment or to locate a dealer.